British Foreign Secretary Margaret Beckett has protested to the US about its use of Prestwick Airport in western Scotland to transport bombs to Israel. Amid the Lebanon crisis, she said it seemed the US was ignoring procedure, and she registered her concerns with US Secretary of State Condoleezza Rice. SNP leader Alex Salmond claimed the UK government must decide whether to "be an aircraft carrier" for the US. The Lib Dems suggested the Americans were taking the UK for granted. Mrs Beckett was asked about the controversy after discussing the Middle East crisis with fellow foreign ministers in Rome. "We have already let the United States know that this is an issue that appears to be seriously at fault, and we will be making a formal protest if it appears that that is what has happened," she said. Opposition parties have reacted angrily to a report in the Daily Telegraph newspaper that two chartered Airbus A310 cargo planes filled with laser-guided bombs landed at Prestwick en-route to Israel from the US. 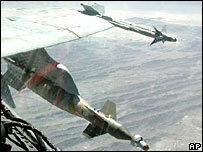 The Israelis have requested the munitions to attack bunkers being used by Hezbollah militants in Lebanon. Do we really think that it's a great idea at this particular moment with an escalating Middle East conflict to have GBUs [guided bomb units] sent to arm one side in that conflict to the teeth? Mr Salmond said that "with an escalating Middle East conflict", it was ill-advised to send bombs "to arm one side in that conflict to the teeth, at a time when hundreds of civilians, many children, United Nations observers, have already been eliminated, killed, by similar weapons". He told BBC Radio 4's Today programme that for the UK to stand up to the Americans, it "would require an independent foreign policy, as opposed to merely acquiescing everything the United States chooses to do". According to BBC Two's Newsnight programme, the US has lodged requests to bring two more planes through the UK carrying bombs and missiles for Israel in the next two weeks. A Foreign Office spokesman said: "We have procedures in place for flights carrying arms. "It's important that they are followed. If they are not, we will raise it with the US but we are not going to comment on US flights transiting through the UK. "The foreign secretary has discussed this issue with Condoleezza Rice." Gordon Corera, the BBC's security correspondent, said there was "clearly some concern within the Foreign Office". "There's embarrassment about the fact Britain might have been used as a staging post and annoyance at the fact procedures don't appear to have been followed. "'Disquiet' was the word one official used to me but for that, read real annoyance," he told the BBC's One O'Clock News. The UK's Civil Aviation Authority said it followed a series of procedures set out by the International Civil Aviation Organisation "to facilitate the international movement of civil aircraft". These "apply to everyone who may be involved in putting or taking dangerous goods on an aircraft", its website stated. Countries must "hold permission to carry dangerous goods" and submit to "audit-style inspections" to "check for compliance". If insufficient information was supplied then all available evidence would be gathered to try to inform the originating state "so that action can be taken there", it said. A spokesman for the Civil Aviation Authority was unable to confirm whether it had been informed of the contents of the flight to which Mrs Beckett referred. A Downing Street spokeswoman refused to comment on the matter, saying it was being dealt with by the Foreign Office. The US State Department said it would not respond either, while Strathclyde Police insisted the matter was "for the owners of the airport and/or central government", as long as "no offence has been committed". 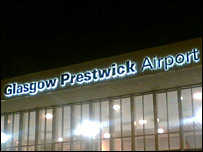 Prestwick - which lies 30 miles south of Glasgow - had supplied logistical aid for military flights since WWII in "moving troops and cargo", an airport spokesperson said. "That support involves allowing crew to rest, refuelling aircraft and providing food and water. "The airport is obliged to allow aircraft from any CAA-registered country to land here." Liberal Democrat leader Sir Menzies Campbell called for the UK government to respond. "If these reports are true, it is particularly provocative for the United States to have acted in this way," he said. "It can only reinforce the belief of many that Britain is taken for granted in the so-called special relationship. "Who knows how many of these munitions may be used to cause the kind of damage to Lebanon which the prime minister of that country described in Rome as cutting his country to pieces." Meanwhile one of Tony Blair's former foreign policy advisers has criticised the prime minister's approach to the conflict between Israel and Hezbollah. "There are times, such as the past two weeks, when a British prime minister should have been thinking less about private influence and more about public advocacy," Sir Stephen Wall wrote in the New Statesman. "Could the Prime Minister really not speak up for the simple proposition that the slaughter of innocent people in Lebanon, and the destruction of their country and the ruin of half a million lives, were wrong and should stop immediately?"